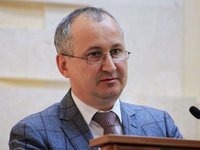 Head of the Security Service of Ukraine (SBU) Vasyl Hrytsak said that an organizer of the "murder" of Russian journalist Arkady Babchenko was detained in Kyiv on Wednesday and that the suspect is a Ukrainian citizen. "I would like to inform you that about three hours ago, we detained the organizer of this crime in Kyiv. Investigatory actions are underway right now and searches are continuing in several places," Hrytsak said at a press briefing on Wednesday. According to Hrytsak, the organizer offered $30,000 to an acquaintance of his who had participated in the military operation in eastern Ukraine and gave him $15,000 to commit the crime. The acquaintance agreed. "Citizen G. offered a man that he knew, a former ATO 9Anti-Terrorist Operation) soldier, to commit an act of terror to kill Russian journalist Arkady Babchenko in exchange for $30,000," Hrytsak said.